I used to look at this pic on 7summits.com during breaks at work to rejuvenate myself! It is an answer and can be a source of inspiration for those asking why people go to the mountains…why we go? to see things like that! 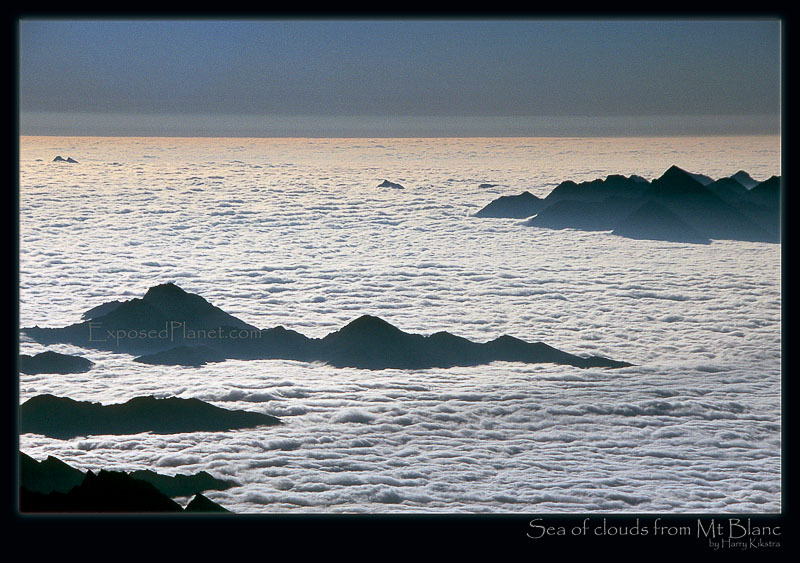 The story behind "Sea of clouds from Mont Blanc"
It is really busy in the summer, but every time I am up there, it is amazing. After a few days of wonderful airy ridgeclimbing we ended up at the summit and as the sun was just out, we saw an endless see of clouds, stretching as far as we could see. Underneath are all the bustling North Italian towns and cities, full off cappuccinos, industry and fashion, but now hidden under a layer of tranquility. Busy Chamonix was just below behind us, but in front of us the empty silent world did not stop and continued forever. It is moments like this that draw me back to the snow, rock and ice of the mountains. The feeling that you cannot get higher, the appreciation of nature and self. Shot on slide film with EOS3, September 2003.